At Miller & Zois, our bus accident attorneys advocate for victims that have been harmed in bus crashes. We have regularly and successfully brought claims against the bus companies and local Maryland municipalities where the bus company or its driver are responsible for our clients' injuries. Like trucks, buses are dangerous instrumentalities on our roads. These bus companies and buses are entrusted with the safety of their riders and, of greater concern from a safety standpoint, the rest of us who are sharing the roads with the buses. In relative terms, bus passengers are relatively safe. The greatest risk is to other vehicles and pedestrians who are sharing our roads with a 30,000 pound bus. Miller & Zois handles claims on behalf of bus passengers. But the vast majority of our claims involve pedestrians and the occupants of other vehicles and their families who have been hit by a bus. Most serious bus accident cases fall into one of three categories: (1) "Garden variety negligence" which means the same type of accidents other motor vehicle drivers make, (2) overpass clearance errors, (3) rollover crashes. Bus accidents are commonly caused by unqualified or poorly trained drivers to handle what can be a complex instrument, bad weather, including failure to use snow tires or chains, lane changes without adequate visibility or attention, and, with increasing frequency in 2015, drive distraction. Another big culprit is left hand turns. A recent Federal Transit Administration study of bus crashes found bus drivers do not "re-scan" crosswalks, particularly during wide arcing left turns. Some bus companies have gone as far as to ban left hand turns because of the risks, making for a more circuitous path but certainly safer. Thankfully, there are not many school bus stop pedestrian accident cases. But they are noteworthy because while few in numbers, the scope of the injury in these cases is high. There are too many wrongful death school bus stop cases in Maryland. It is incumbent upon bus drivers to follow Maryland law and local statutory and administrative law in following fundamental safety instructions, like activating the bus' stop bar and warning lights prior to letting students exit the bus, keeping the students within the driver's view at all times until they have reached safety, and requiring students to cross in front of bus. The question in many of these cases is whether there is civil liability of the bus driver and his employer (usually the school) for the death or injuries to a child who was struck by a car while in the street going to or from the child's school bus. Clearly, the school bus driver has to provide children with a reasonably safe place to board and depart the bus. Maryland has clear law on this. Education Article 7-801(b) imposes upon the state and county board of education the obligation to provide safe transportation system for students, requiring that the county (or Baltimore City) provide for the transportation for public school students. Assuming this burden, the law also recognizes the obligation to do what can reasonably be done to keep these children safe. 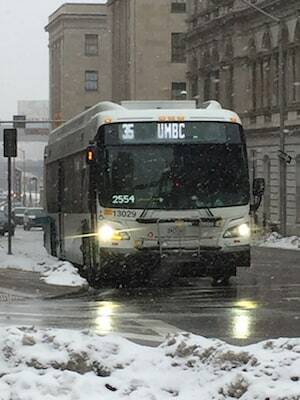 Maryland regulations say that the prime consideration is the safety of the students on these buses. See COMAR 13(A).06.07.13(A). One of the big risks for students is crossing the road to get on or off the bus. Busy road and intersections compound this concern. Maryland law requires that on four lane highways "students shall be picked up and discharged on the side of the roadway where they reside.” See COMAR 13(A).06.07.13(C). There are also other pick up and drop off area questions where the bus driver and the school system will be held to a reasonableness standard under Maryland law. Is it reasonable to subject the children to the risk of where they were dropped off given the age of the children, the traffic at the stop, and all of the other safety considerations? That is the key question in determining liability. To determine whether there is liability, our lawyers look at the entire picture. Sometimes, what does not seem like negligence at first glance is the result of the bus driver's error after you dig through all of the facts of the case. Is the bus stop in the correct location? Did the driver stop at the wrong bus stop, thus creating circumstances leading to the accident? These are all the questions that have to be asked. The lawyers for bus companies and their drivers have a knee jerk reflex in many bus accident cases: there was a blind spot. This argument carries no weight. In 2015, there are no blind spots for a professional driver on a bus that is properly equipped. Today we have better mirrors, cameras and radar that can reduce a blind spot to zero. A blind spot can only be the result of a bus company that did not deliver modern technology to the driver or a bus driver that did not use it (or does not know how to use the equipment). If the negligent party is a governmental actor, there may be a short time frame to file notice of the claim in Maryland (and in many other states). If you take nothing else from this article, please make sure you contact a bus accident lawyer just to make sure you appreciate any procedural obligations you may have to protect your claim. If you or a loved one has been injured in a bus crash, you need the experience of a Maryland bus accident attorney that knows how to handle these cases. Our attorneys have the knowledge of the procedural roadblocks as well as the know-how and resources to fight on your behalf to get you what you deserve. Contact us at 800.553.8082 or get a free case evaluation online.